Convey has two apps. One for building messages on your iPhone called "Convey Maker"
and one for Playing your messages on Apple TV called "Convey Player"
Convey Maker will ask you what photos you want from your camera roll. Set how long you would like each photo on the screen per cycle. Save your Message by giving it a name and sharing it with an Apple TV on your network. Convey maker looks in your camera roll for photos. If you use dropbox as a shared file for your creative team. You just click save image to add it to your camera roll. Once your graphics are in the camera roll you click add in the lower left of the convey maker app. which will show you all your photos in your camera roll. Each slide can have its own duration on the screen. 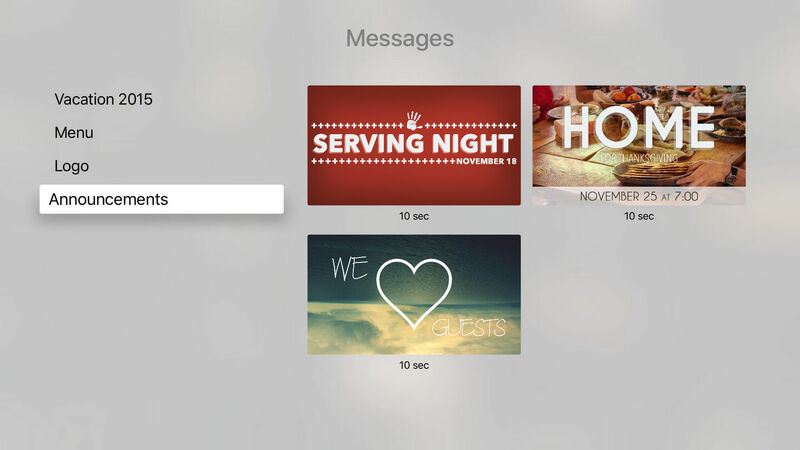 Every message is set to continuously loop the entire message the duration is for each slide per loop. Name your message and send it to an Apple TV on your network. Convey will look for all available Apple TVs and show them to you in a list for you to choose. After you have sent the message Apple TV will upload it to your iCloud account so all your messages will automatically show up on those TVs as well. Send Messages to the TV. Use an iPhone to send your messages to the Apple TV. Super simple to have anyone play the message. Stand back and admire how polished and professional your digital signage is and yet was a breeze to setup. Send your message to the TV. 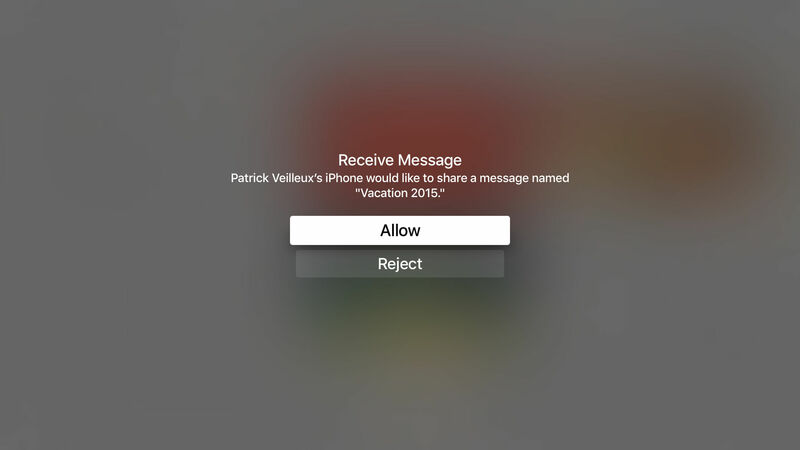 Tell Apple TV to allow the message from your iPhone. Convey Player can be found by any iPhone on your network to accept a completed message. Allowing more than just one device to build messages. Simple enough for anyone to start your message. Sometimes the person who is technical and the person who is suppose to operate the technology are different people. Convey Player is as simple as choosing the right message and pressing select. If the message we sent was titled Announcements you will see it as soon as it finishes sending from the phone. All the other messages that have been sent are also there should you want to play those as well. With their durations under each slide. If you can push play you can run our digital signage. Your message, Announcements, is now playing with the set durations of 10 second per slide and will continually, until you tell it to stop. Apple, the Apple logo, iPhone, and Apple TV are trademarks of Apple Inc., registered in the U.S. and other countries. App Store and icloud is a service mark of Apple Inc.